For individuals experiencing health issues for whatever reason. 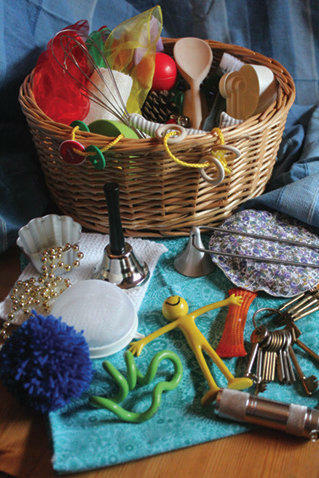 Memory Baskets and packs have therapeutic tendencies for adults and elderly. We all benefit by recalling past memories, using our senses, particularly beneficial for those experiencing Dementia / Alzheimer’s . The sound of the sea, the feel of the sand, the taste of fish and chips and the smell, or similar experiences, all remind us of happy child/adult memories. Equally, natural items and household items can remind us of happier times, for example, baking using a wooden spoon and whisk. Knitting with wool. A bunch of keys can hold a number of memories. Photographs of family. Pictures of places. The smell of wood, leather, lavender can hold happy memories for different people. What we see, hear, touch, taste and smell can bring back wonderful memories, helping us to feel good and have a calming effect. 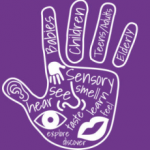 Sensory Treasures provide a basic pack in a drawstring bag, that can be carried and transported making it accessible wherever. Also pictured is our Activity Square. Each ribbon has a ring attached, making it easy to add personal items belonging to the individual, making it unique for them e.g. keys, wool, wood, keyring, photographs etc. The Activity Mat in the photo comes as seen. It is cotton on one side and towelling on the other, it crinkles when held. It comes with a coil clip that can be attached to a chair. Although contents may vary in colour, it will always be to the same value.